Invented in 1950s by music teacher, songwriter and inventor Harold Rhodes (1910 -2000). 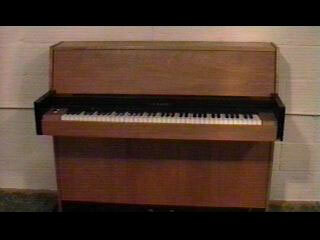 1959; 2 1/2--octave Piano Bass was first model produced (and the only pre-CBS Fender Rhodes instrument). Early models have controls mounted directly on front of lid; later ones have separate panel. Some early models covered in beige "Fender tweed" instead of black Tolex. Top available in in sparkle silver or gold, or Fender "Fiesta Red". Celeste was 3- or 4-octave "treble" version. 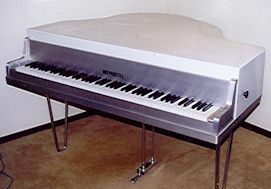 1965; Suitcase Piano introduced , amplifier/speaker cabinet with built-in sustain pedal doubled as stand for keyboard; 73 notes, 61-note model announced but never put into production; curved top available in various colours as Piano Bass above, some cases covered in "Fender tweed" as above. Later models had stereo tremolo. 1971; 88-note Suitcase Piano introduced; same amp/speaker/stand as 73. All tops and cases now available in black only. 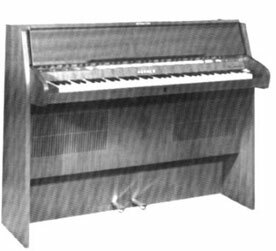 Mk I Stage Piano introduced at this time; 73 or 88 notes, no amp/speakers; four steel tube legs, sustain pedal attached via metal rod. 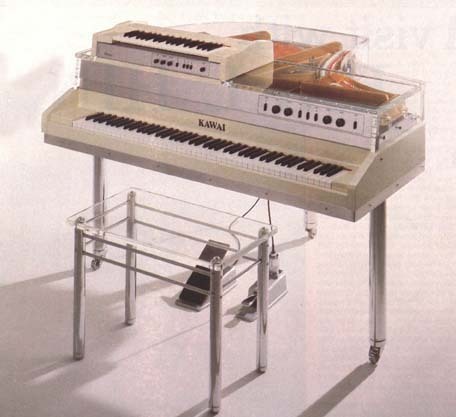 1979; Mk II Stage and "Flat-top" Suitcase models; All models now have flat ridged top and improved action. 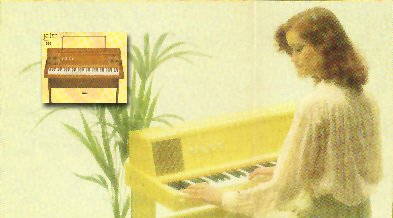 1980; 54-note Mk II Stage Piano introduced; flat top, slider controls. 1982; short-lived Mk III EK-10 combined electromechanical Rhodes mechanism with electronic oscillators and filters. 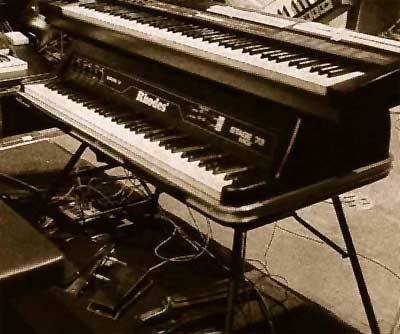 1984; The Mk V* was the last electromechanical Rhodes instrument for over 15 years, and 3 examples were equipped with MIDI outputs. Completely new case design made from lightweight plastic. 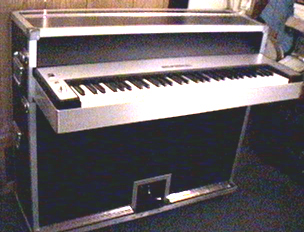 2001; A few months after the death of Harold Rhodes, Major Key (a company dedicated to the upgrading and maintenance of Rhodes pianos) exhibited a brand-new 54-note Stage Piano at the winter NAMM show, made using over 60% new parts and featuring an active preamp, beige Tolex covering and silver sparkle flat top. This appears to have been a one-off instrument; a promised limited-production model never appeared. 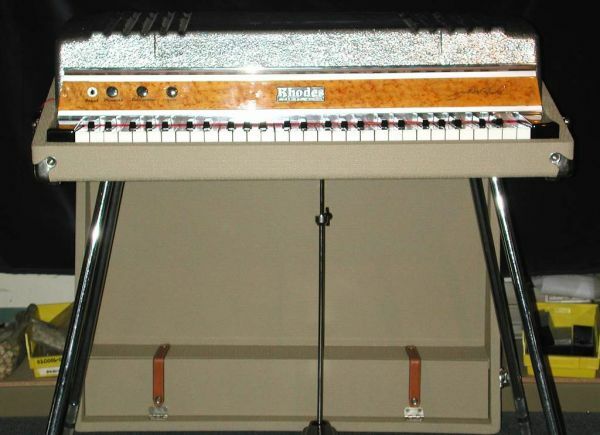 2009; After a gap of nearly 25 years, a completely new Rhodes Music Corporation began commercial production of the newly-designed Mk 7, first seen in prototype form at the 2007 Winter NAMM show. The Mk 7 range featured an improved Mk V-style action, a lightweight fibreglass case and an overall improved build quality compared to vintage models. 88-, 73- and (for the first time commercially) 61-note models were advertised, along with optional "speaker platforms" similar to the old Suitcase base. 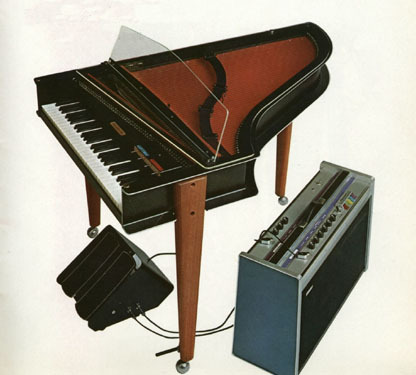 All three sizes were available in three options; "S" (passive, equivalent to the old Stage model), A (active preamp with stereo tremolo, similar to the old Suitcase keyboard unit but usable without a dedicated amp and speakers, and "AM", as model A but with full MIDI controller capabilities including polyphonic aftertouch, split zones, pitch and modulation wheels. Initially, three colours were available; black, white and red, all available in gloss automotive paint or a rubberised "RoadTouch" matt finish. Rhodes Music Corporation ceased trading in 2011. 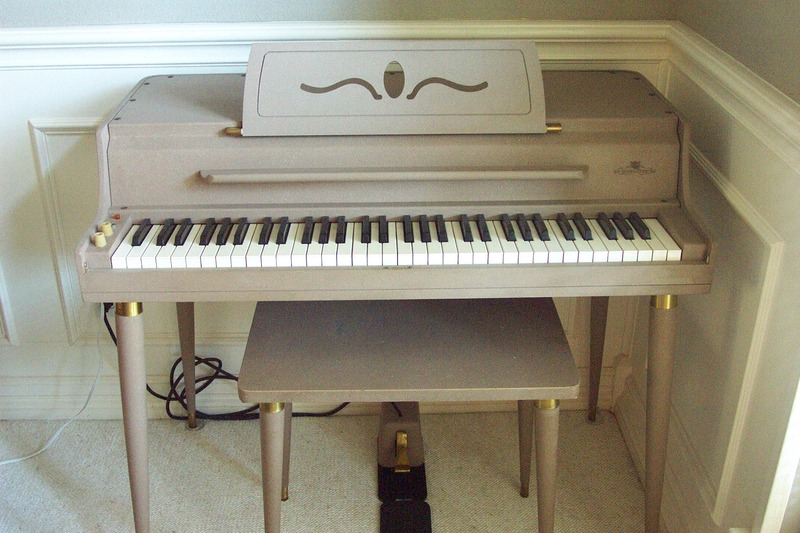 Little is known about the Student Piano; mid 1960s - early 1970s; A late 60s model looks virtually identical to the 1969 "Home Piano" described below, but with no volume pedal and with the controls mounted under the keyboard. There were at least two earlier models - the single pedestal "fishtail" version and a "double pedestal" design. Built-in metronome. Controls mounted on pod under keyboard. Colours included avocado green and mustard yellow! (this information was told to me in 1980 by Harold Rhodes at the Fender factory in California). The Home Piano is even rarer. Three different designs are known. In 1969 there was a Home Piano, with wood-grain panelled sides, black curved top, a music rack and a built-in cassette recorder. This model featured a unique spring-action volume pedal. In the late 70s a new model was produced, with a completely wooden cabinet and again a cassette recorder. In the early 1980s I saw a completely different Home Piano in London. This was a UK-built black piano-style cabinet housing the mechanism of a Suitcase Piano. * The reason that the model numbers appear to jump from Mk III to Mk V is that the "missing" Mk IV was a new design concept which never made it to production. 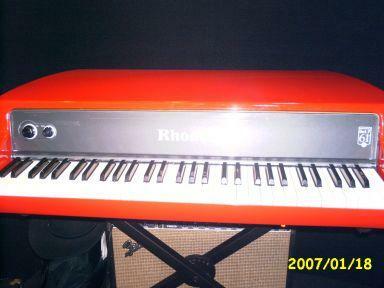 Around this time there was also an ELECTRONIC piano made under the Rhodes name by ARP. A new design from vintage keyboard renovation experts Vintage Vibe, using newly-designed action parts in a lightweight wood-and-fibreglass case similar to that of a Wurlitzer 200. 64- and 73-key models were introduced at the Winter 2011 NAMM show, in passive, active and active stereo versions. The fibreglass top is available in a wide range of plain and sparkle colours to order. 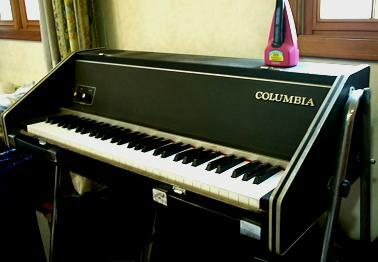 Later additions include 44-note models (including a bass piano) and a less expensive 64 Classic with a black ABS top. Another new design from Vintage Vibe, this is the first new Clavinet-type instrument since Hohner stopped producing the E7 in the early 1980s. The Vibanet features onboard active EQ and auto-wah, plus improved tuning and damping mechanisms. Designed by Gibson Guitar's chief R&D engineer Lloyd Loar for his own short-lived Vivi-Tone company, which also produced electric guitars, basses, mandolins and fiddles. An earlier Loar design using sticky pads and electrostatic pickups was later adapted by Hohner for the Pianet. Based on 1920s patent by Lloyd Loar, ex Gibson Guitars (see Vivi-Tone). May have been introduced as more touch-responsive successor to Cembalet. N had tremolo; M had phaser and speakers. Models L, C, N and Combo Pianet used electrostatic pickups; reeds were plucked by leather and foam pads impregnated with a permanently sticky compound and these doubled as dampers when a key was released. It would appear, however that SOME Pianet Ns were fitted with the same plectrum and damper mechanisms used by the Cembalet (see below). This may have been a strategy to use leftover Cembalet parts when the Pianet was introduced. T and M were last of series; used electromagnetic pickups, silicone rubber sticky pads and more mellow-sounding reeds. All except T had wood-veneered cases; L was simple rectangular case, no lid, mounted on metal rod legs, built-in speaker, no tremolo. 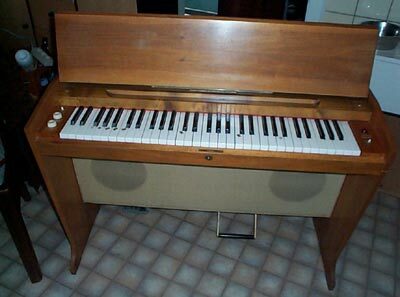 N was classic 1960s electric piano with folding lid/music rack and "boomerang" inverted-V-shaped legs. Optional amplifier fitted underneath. C was similar to N but mounted on "coffee-table" legs. 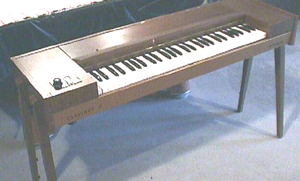 Combo Pianet was stage model without folding lid; no tremolo or speakers. 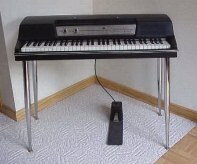 M was domestic console model from 1970s with fabric-covered speakers above keyboard ends and flat-topped "piano-style" black keys. T had black leather-cloth covering and rubber-padded end-blocks. 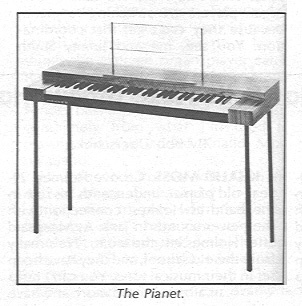 See also Clavinet Pianet Duo. Cembalet N visually similar to Pianet N, but different keyboard range (C-C as opposed to F-F or F-E) )and brighter tone. Mechanism comprised rubber plectrum and separate damper. Optional amplifier fitted underneath. Cembalet II is console model with vibrato, valve amp and speakers and built-in volume pedal. Two unrelated instruments sharing the same name. 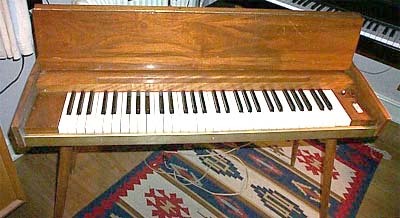 Original British-made instrument as depicted in 1939 UK patent is conventional upright piano fitted with electrostatic pickups. Brazilian design, similar to Columbia Elepian. Made with varying keyboard ranges at a variety of workshops in Brazil. Later models branded "Valente". Relaunched at 2016 Winter NAMM show as "Bossa". 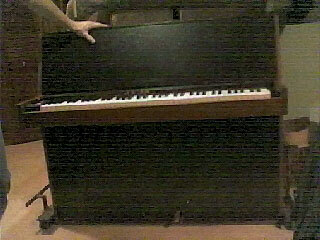 2-keyboard version with "Matador" combo organ on top keyboard. Made by long-established accordion and harmonica manufacturer in Klingenthal, formerly East Germany. 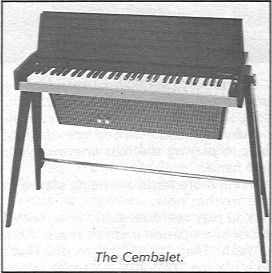 Appears to be an approximate copy of the Hohner Cembalet, and is the only known Eastern European electric piano. Unlike Hohner instruments of the time, uses electromagnetic pickups. Later models somehow acquired a sustain pedal! Also a 2-keyboard version with "Matador" combo organ on top keyboard. The piano-and-organ version has no known equivalent in Hohner's range. 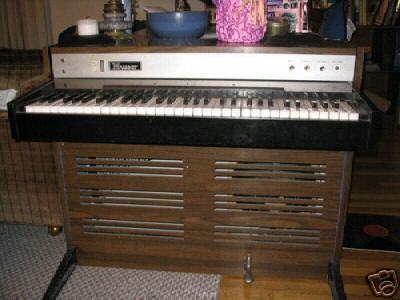 There was also an electromechanical strap-on bass keyboard, called the Basset, closer in principle to the Rhodes Piano Bass than Hohner's electronic bass keyboard of the same name. Clavinets I and II were domestic models with tone switches (II), rectangular veneered case, wooden legs and speaker (I). 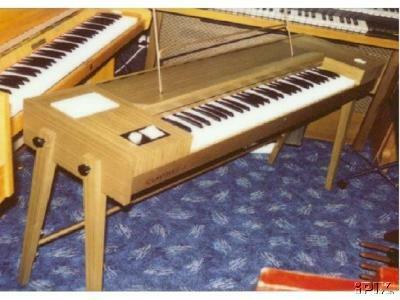 Clavinet L had reverse-coloured keys, "triangular" case, speaker and three "coffee-table" legs. 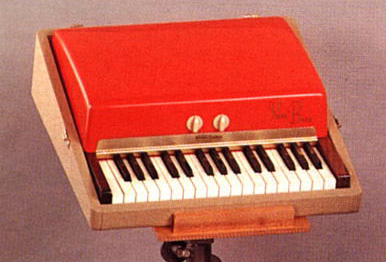 Clavinet C was the late-60s "Stevie Wonder" model - red and white case, mechanically identical to Clavinet II. 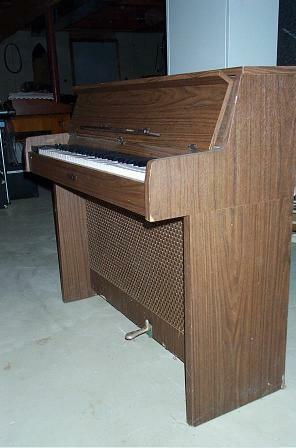 Clavinet D6 was classic wood-veneered 1970s model. D6 and later E7 had two pickups and various tone switches, plus variable damper. Duo combined Clavinet and Pianet actions in one keyboard. E7 was like D6 in a more roadworthy case. First E7s were actually labelled D6. Later E7s had angled damper slot. Similar mechanism to Fender Rhodes design. 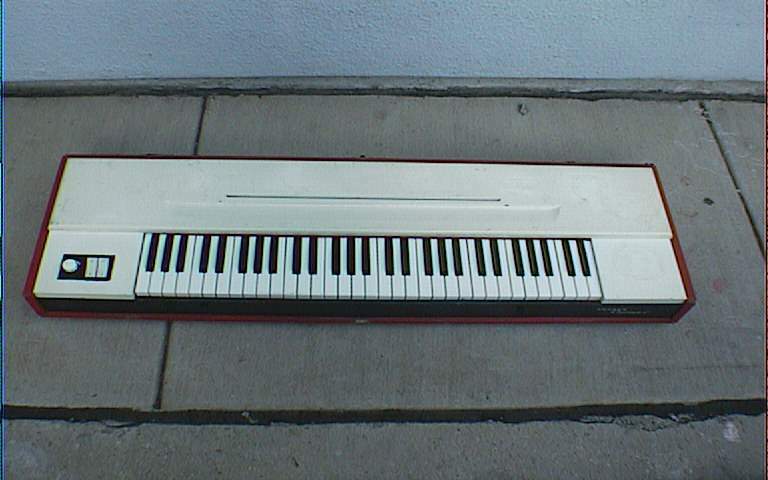 72-note keyboard. Console model has wooden upright-piano-style case with 4 speakers and 20-watt solid-state amplifier. Sustain and soft pedals fitted; soft pedal is actually electronic attenuator. 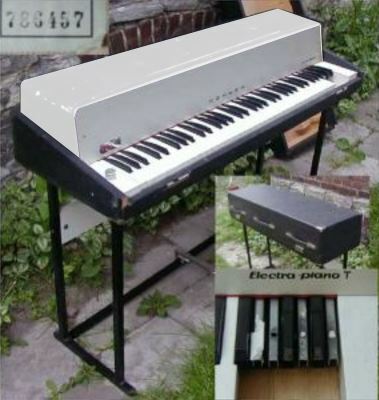 Electra-Piano T is late-70s "stage" model; looks like somewhat home-made copy of Fender Rhodes with white top; folding legs; no "soft" pedal, amp or speakers (although matching amp was available). Different mechanism from console model. Very rare. Imported and re-branded console-model Columbia Elepian. Could Gibson have had something to do with it? (Maestro was a name used for Gibson's amplification and effects lines in the '60s). 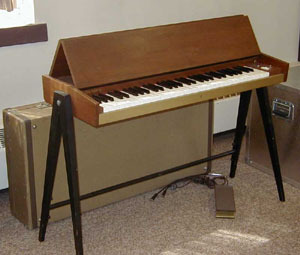 At least two models; portable "stage" model similar to Rhodes or Wurlitzer 200 and domestic model in lightweight wooden console case; looks like small upright piano. Similar mechanical design to Wurlitzer. 61 notes, sustain pedal, no tremolo. Elepian name still used for Denon's digital pianos. (USA, West Germany) Struck metal reeds, traditional piano action, electrostatic pickups. Designed by Ben Miessner. Early models had valve pre-amps; later ones had tremolo circuit. All had built-in speakers except battery-powered EP-200B. 100 series (up to late '60s) had painted wood or fibreboard cases; 140B was first solid-state model; EP-200 onwards had plastic cases. 700 series were wooden-cased console models. 300 appears to have been a wooden-cased console model built around a 200, and made in Germany for the local market. Except as noted, all models had 64 keys. EP-200 available in various colours. EP-200A only available in black. 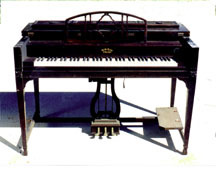 Baby Butterfly Grand was NOT electric grand but same mechanism as model 200 in semi-circular wooden cabinet with twin angled lids above upwards-facing speakers. (Wurlitzer had made acoustic pianos in this style since the 1920s). Designed by orchestral percussionist and composer Clair Omar Musser (1900 - 1998) and manufactured by his own company. 61-note keyboard. Has controls for bass, treble and tremolo - Musser was a vibraphone virtuoso. Designed by Prussian Nobel Laureate Professor Nernst, in conjunction with Bechstein and Siemens. An early electric grand. I don't know how many were made or who they were aimed at, but at least one survives in the Deutsches Museum in Munich, Germany. 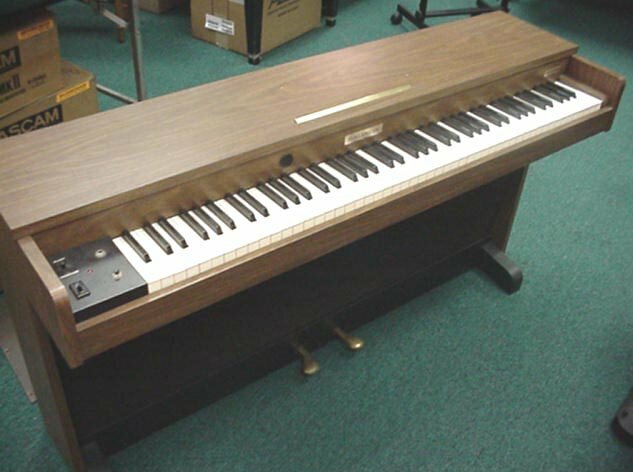 An electric upright piano, originally developed (like the Rhodes and Wurlitzer) for school and college piano labs but, unlike them, rarely seen beyond that environment, largely due to weight and tuning needs. However, in the early 1970s, a portable and roadworthy stage model, the ElectroPro was produced. I believe that an electric grand was also made. The world's first and only solid-body electric harpsichord, with an extruded aluminium frame/body, bright red dummy "soundboard", and clear perspex lid and music rack. Looks like something out of the Jetsons, but was used on dozens of TV and movie scores, the Beatles used one ("Because" on Abbey Road) and the Beach Boys even took one on tour (along with a professional tuner). Electric grands except CP-60M; electric upright. "M" models incorporated MIDI output. CP-70 had 73-note keyboard, CP-60M had 76. CP-10, CP-20, CP-30 are unrelated ELECTRONIC pianos. 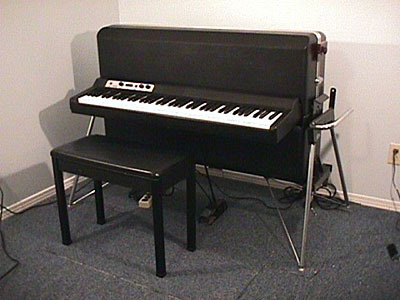 Small (73-note) electric upright; tubular steel frame, folding keyboard. Built by Lindner in Shannon, Ireland under license from Dutch manufacturer Rippen. The Lawrence was built alongside Lindner-branded acoustics using the same novel lightweight construction and action. The piano's action is mostly made from plastic, making damaged instruments difficult to repair. Nonetheless, Stevie Wonder recorded with one and appeared in advertising. Small (73-note) electric upright; no soundboard. Acoustic pianos (made by Kimball) designed to fold up for transport and fitted with Helpinstill's acclaimed pickups. Roadmaster 64 had shorter (64-note) keyboard. (Japan) Struck strings; traditional piano action; piezo-electric cable pickups Various grand and upright models, some with MIDI. Similar to Yamaha's designs, but sounded more acoustic. Some had MIDI output.